Abbey Hill was a small rope tow area that operated about 1 mile north of Great Barrington. It was first a hike up and ski down area in the 1930's, and was floodlit at night. Then, after WW II, a rope tow was installed, which operated until at least 1953. The area likely closed at some point in the 1950's. I tried finding the area in March, 2001 with my family. We found the hill, but was totally overgrown, and no signs of the ski area could be found. Houses were also built in around the base. I'm guessing based on tree growth that the area was simply a large field. 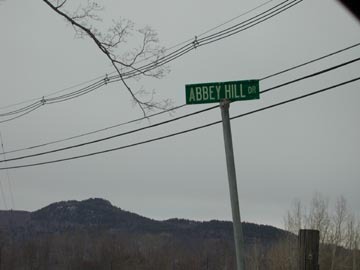 We did find Abbey Hill Road which goes up the hill, here's a street sign from that road.